I had to wait until later today to make this post as it is about Shower themes! We threw a double surprise baby shower today for two of the girls at work and that got me thinking about non-traditional baby shower themes. 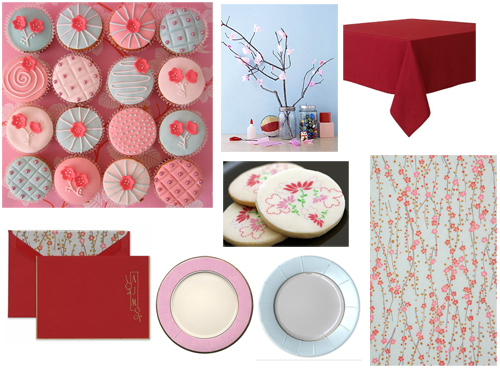 Images (from top L to R) cupcakes from flickr user hello_naomi, cherry blossom centerpiece at marthastewart.com, red table cloth via target, cherry blossom paper at paperstudio, cookies from Cutie Pie Cookie Co., Caspari plates and Crane stationery from finestationery.com. The cookies were actually my inspiration (what can I say, I skipped breakfast this morning) for this simple and modern shower theme. They would make adorable favors for any occasion. Too cute! If you need a more substantial sweet, cupcakes in shades of red, blue and pink pack are perfectly portioned and easy to handle. Tracking down an attractive runner was actually fairly easy - this motif is loved by bookbinders and stationery aficionados alike. The centerpieces are simple to put together, a little glue and tissue paper on an attractive branch and *voila* inexpensive and attractive decor. Who else but Martha could think of something so perfect? This theme would work well as a bridal shower or baby shower. If the guest was anticipating the arrival of a baby boy, you could easily pull more of the reds and blues. If they are expecting a girl, it would be easy to make pink the focal point. Really, pink and blue feature prominently in the designs that it would also be attractive for anyone expecting multiples.